Made by Kerry, Charles H in Sydney, New South Wales, Australia, 1891-1892. Glass negative, full plate, 'Technical College, Ultimo', Kerry and Co., Sydney, Australia, 1891-1892. Silver gelatin dry plate glass negative in landscape format. 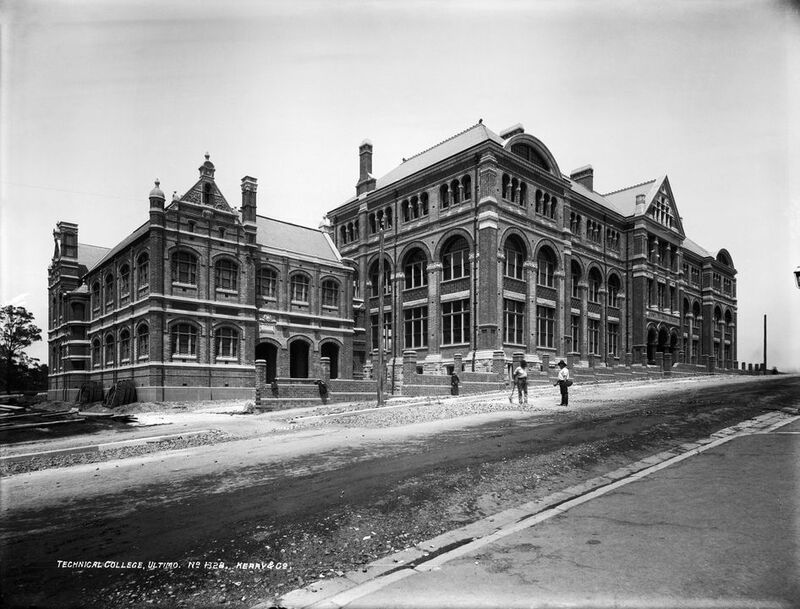 The image depicts the Sydney Technical College in Mary Ann Street, Ultimo. The image is taken on Mary Ann Street looking towards the building. The former Main College Block building is depicted in the centre of the image. This building is inscribed 'Sydney Technical College'. A brick fence can be seen on front of the building. Mary Ann street is depicted in the foreground of the image. Two men can be seen standing in the middle of the street holding shovels. Another man or boy can be seen leaning on the fence and clothing can be seen resting on the fence. A construction area can be seen in the centre left of the image, this is most likely for the construction of the No. 3 Building of the Technical College which was occupied by the Indistrial, Technological and Sanitary Museum (later the Museum of Applied Arts and Sciences). The former Main College Block building of the Sydney Technical College was designed by William E Kemp in the American Romanesque style. The large three-storeyed brick building was built in 1891 and is decorated with sandstone and terracotta tiles. The building is symmetrically designed with a central pedimented bay. The portico, depicted in this image, is colonnaded with polished columns supporting sandstone arches. The interior includes Art Nouveau joinery and leadlighting. Charles Kerry was born in 1858 and by 1885 was running a studio in partnership with C. D. Jones. This partnership lasted until 1892, when Charles became sole owner and changed the studio's name to Kerry and Co.
By 1890 the company was employing a number of photographers who would become famous in their own right. George Bell who covered rural New South Wales was employed in 1890 and Harold Bradley was doing outdoor work and covering events around Sydney by 1899. Kerry continued to work in the field and in 1895 he took photographs of Royal National Park for New South Wales Government, photographed Queensland artesian bores and was employed by the New South Wales Government to travel the state and photograph Indigenous Australians. In 1897 Kerry led the first party to reach the summit of Mt Kosciuszko in winter conditions and photographed the Jenolan caves. By 1900 Kerry had turned his studio into one of the largest and most respected photographic establishments in the colony. His new four story premises at 310 George St were designed by the architect H. C. Kent and the third floor studios alone could accommodate 70 people wanting their portraits taken. In 1913 Kerry retired leaving the running of the studio to his nephew, unfortunately the business did not do well and Kerry and Co. closed its doors in 1917. Kerry himself died in 1928. James Tyrrell used the images by Kerry & Co. and Henry King to produce his own booklets and views of New South Wales but although full of iconic Australian images, the collection does not appear to have been fully utilised by Tyrrell. In 1980 the collection was purchased by Australian Consolidated Press who published a limited series of 2000 contact prints from the collection. Housed in boxes copies of these were given to the State Library of New South Wales and the Macleay Museum at the University of Sydney. In 1985 Australian Consolidated Press donated the collection to the Powerhouse keeping a set of copy prints for themselves. The collection at this time consisted of 7,903 glass plate negatives and 7,916 contact positive prints. A further 2,500 Kerry & Co. negatives are held in the Macleay Museum at the University of Sydney, although these do not appear to have been acquired from Charles Kerry and Co. by Tyrrell.